Ugh. Nothing stops readers in their tracks faster than a dead-end 404 page. 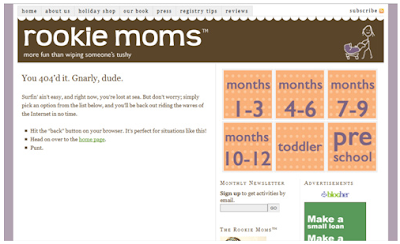 This guest post from Whitney of the ever-so-helpful RookieMoms.com shows you how to customize your 404 page to send readers in the right direction. I have been recently trying to take action on the many tips doled out by Darren Rouse of Problogger.net. A recent newsletter urged his followers to take a closer look at some of their supporting pages, such as About Us, Advertise Here, and 404. I decided to revamp our 404 page. It only took a few minutes and it felt so productive! I thought I’d share our before and after. The only useful link in the body of the page is one that goes to the home page. Everytime I ran into this page on my own site, it sort of bummed me out that the tone was not appropriate for our audience. We have a sense of humor, for sure, but our site is for grown women, not teenaged surfers from the 1980s. I decided to update our 404 page to give users a quick snapshot of what our site is all about, and provide them a fast way to get to valuable content. The copy suggests that they may be looking for content in a category that is listed below. I wrote out the categories in a more complete way than my navigation buttons allow. 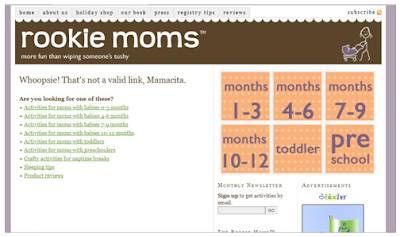 For example, the first link reads “Activities for moms with babies 0-3 months”. Some sassy sites have images of lost or disoriented folks on their 404 page. This can also convey your website’s personality. What’s right for you really depends on your target audience. Note: As of this writing, custom 404 pages are not available for Blogspot blogs.